Robin writes to say that this is a photograph of a train at Tregarth Station (Bethesda branch). It shows a train of six coaches and a small locomotive. All but the end coach appear to have four or five doors on the side nearer the camera. The Penrhyn Railway track is in the foreground. Robin would like to know the date of the photograph. The date for the Tregarth photo might be verified if someone can find the date the Penrhyn N.G. line was built. The track in the foreground isn't yet ballasted so this might be the clue! Somewhere I have a book on the line, this will give the answer, but I think I lent it out somewhere. Tregarth LNWR station was opened on July 1st 1884, but (according to Peter Baughan's D&C 'Regional History', vol 11) the adjacent Penrhyn NG line was already in use and loco-worked by 1878. Unless this isn't the whole story - maybe there were unmentioned later realignments of the Penrhyn - it looks as though the best way to establish an 'earliest possible' date for the photo might be from any identifiable changes in the visible buildings and landscape. Or maybe someone who knows about carriages will be able to fine it down a bit, but until then I'd guess 1884-1900. Which isn't much help: sorry! 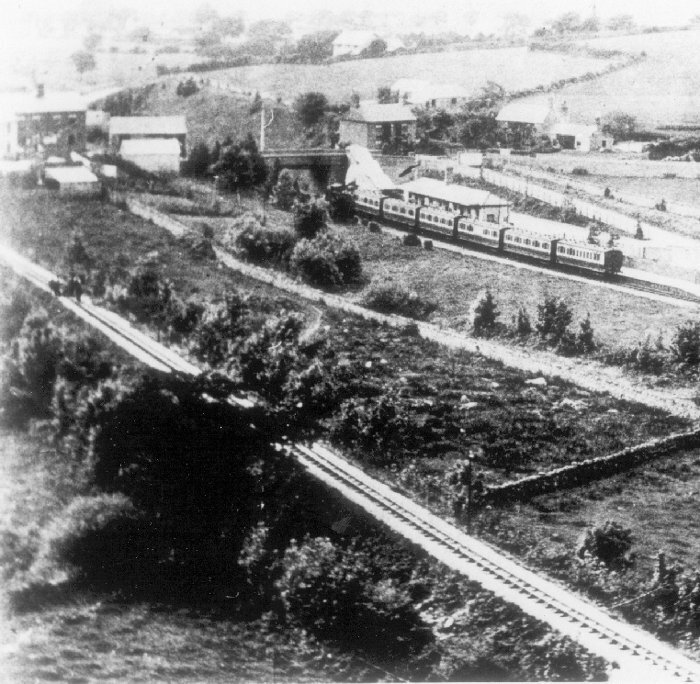 I have attached two photographs showing the Bethesda train in the Bethesda Bay at Bangor Station. The first clearly shows the Branch Set about to depart for Bethesda, and judging from the photograph it must have been taken before 1923 when the station was altered and the signal box on the platform in front of the train was removed to its new position. I have attached another photograph which shows 'Precursor' 4-4-0 Greyhound at the head of the 5.25pm Holyhead to Chester train. On the right is the 6.28pm 'Motor' or push-pull, LNWR 2-4-2 Bethesda Branch train, arriving in the then new short bay platform. The date of this is known to be July 1924. This probably adds more confusion, rather than dating the original photograph, but I hope is of interest! I have seen the original of this photograph bearing the date 1913. This photo is reproduced in Gwynedd Railways in Old Photos (p90) and I have it in my head that I have seen the photo elsewhere credited to Gwynedd Archives at Caernarfon. Details of the book are: HITCHES, MIKE, (1990), Gwynedd Railways in Old Photographs, Alan Sutton Publishing Limited, Stroud, Gloucestershire.